300m from the beach huts (European Blue Flag), on the south coast of the island of Oleron, "Les Hameaux des Marines" is situated behind a dune, in a quiet and relaxing near the lighthouse Chassiron and the port of Saint Denis d'Oléron. You will have the opportunity to entertain the ocean, go to bike the bike trails of the island or enjoy the good dishes of seafood in the many traditional restaurants in Saint Denis and surroundings. This charming and friendly residential park is the ideal place to relax and take a deep breath of fresh air. The hamlets of Marines residence consists of chalets located on 2 ha park. 35m The chalets consist of: a bedroom with a double bed, 1 bedroom with 3 single beds (one downstairs and a bunk in a drawer, the bottom two beds can be converted into double bed), a living / dining room with a sofa bed for 2 persons, flat screen TV, equipped kitchen (4 hotplates, dishwasher, microwave, fridge ...), bathroom with shower and washbasin, separate toilet, air conditioning supplement, 15m² terrace with garden furniture. On the spot: bowling, table tennis and a children's playground. An indoor heated swimming pool (from April 12th to November 1st), free parking next to your cabin, free WIFI at the reception, bread, bicycle rental. Short stays possible from a night. nous avons été tres contents de notre séjour,hormis l'accueil très limite.les heures d'ouverture (seulement 4 h par jour) étaient restreintes et laccueil était fermé les jeudis et dimanches. La personne présente était parfois à peine aimable. La description de l'annonce correspond à la réalité. 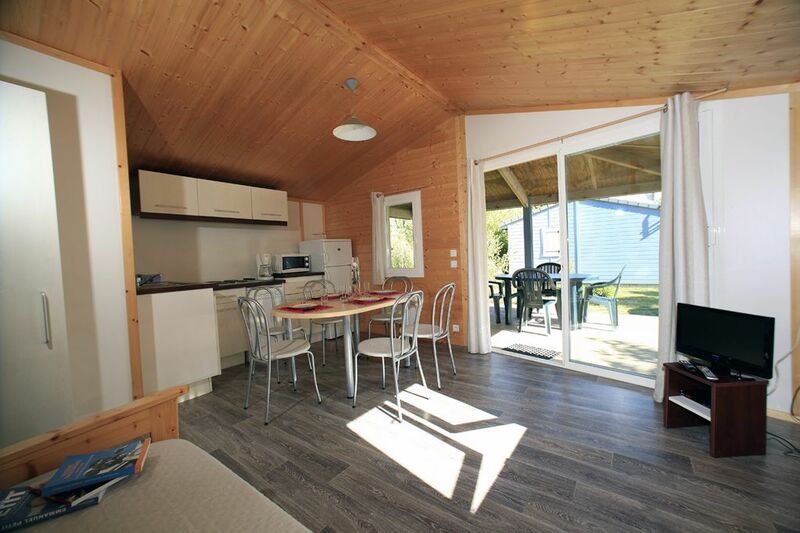 Chalet neuf, propre et spacieux. Le personnel du camping est très disponible. Un vrai plus : piscine chauffée et couverte. La livraison du pain le matin est un vrai confort. Oui je conseille cette location.